I was only halfway kidding about my nervousness around joining a brand new D&D group at Legion Games in Minneapolis. Even at age 40 I feel anxiety in meeting new people, particularly if the meeting occurs in a new environment for me. But there was nothing to be nervous about. I entered the game store 10 minutes early, walked past the 50 or so Magic players, and spotted the DM screens on the back tables, a dead giveaway that these were the fellow adventurers I sought. That’s all it took. Everyone quickly introduced themselves and were very welcoming to me, a total newb who hasn’t played D&D in 20 years. The DM asked which character class I created, then asked to see my character sheet (here’s a full rundown of my character creation process). He wrote down a few key attributes of my player, then noticed which faction I chose, which was Order of the Gauntlet. Factions are an interesting part of the D&D Adventurers League. Each player chooses a faction for their character, which not only enhances role play, but also will ultimately unlock ‘secret missions’ you can go on that are particular for that character’s faction. 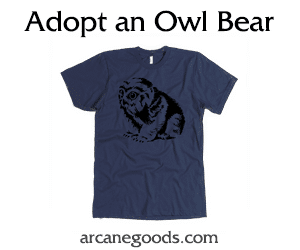 Holy smokes, I’m into unlocking secret content, so wrapped my arms around this idea of choosing a faction and gave it a big owlbear hug. I chose Order of the Gauntlet, thinking that it best fit Didier Hutu, the cleric I created specifically for Adventurers League. Wizards of the Coast (parent company of Dungeons and Dragons) really did this right! 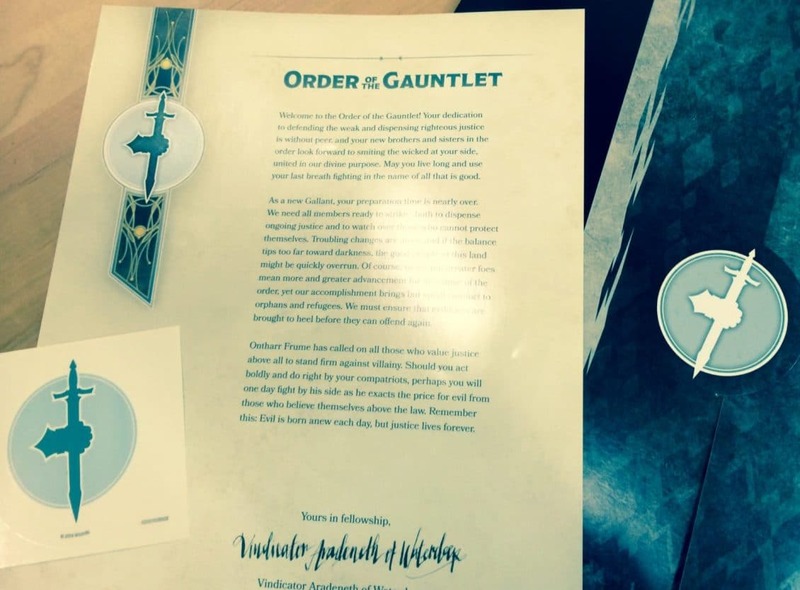 Each Adventurers League player got a folio that was unique to their chosen faction. Inside the full color folio was a table standee for you to write your and your character’s name, a glossy welcome letter from the fictional faction leader, a certificate that entitles adventurers to a free spell cast that also doubled as a redemption code for the Neverwinter MMORPG, and a couple other certificates and blank log and character sheets. After our GM helped another new player finish creating his character, he asked us if we were ready (uh…YEAH! ), then he launched right into the adventure. Without trying to spoil anything, the scene was a keep which was being besieged by nasty cultists, snarly kobalds, and other multifarious evil doers. The keep’s guards were being overrun, so it was up to our mighty adventurers to bring order and justice! Our DM did great and setting the scene so our imaginations could picture the battle. Then almost immediately were the magic words, “roll for initiative,” and the battle began. The adventure wasn’t a masterpiece of RPG writing, but it was darned good and we had a blast, which is ultimately the point. There wasn’t much role play in the adventure, which gave me a titch of disappoint. I was excited about my character and did a lot of work in creating his background and personality, so it would have been fun to show that off a bit. Instead, the adventure was pretty much killkillkillkillkill, which, let’s me honest, I was ultimately pretty stoked about. I even kept a tally of my kills and I’m pleased to announce that my pretend cleric imaginarily eliminated three mythical kobalds and one fictionally heretical evil cultist. In my mind, I was feeling good. This will improve with time. Right now I’m rusty and unsure, so I looked to the veteran players to provide the bulk of the direction. Even toward the end of the adventure I could feel me getting my feet under me and was gaining confidence in what I should (or shouldn’t) be doing. 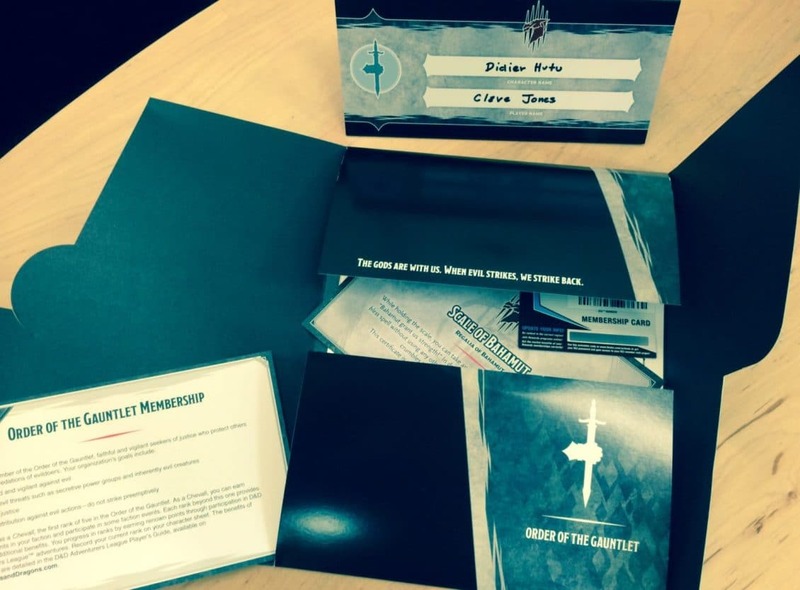 The swag was GREAT – Adventurers league is off to a great start. But more than that, the new D&D rules are streamlined and fun. But even more more than that, the RPG gaming community is as strong and welcoming as ever. All of the blended together created a fantastic experience and I truly had a wonderful time. 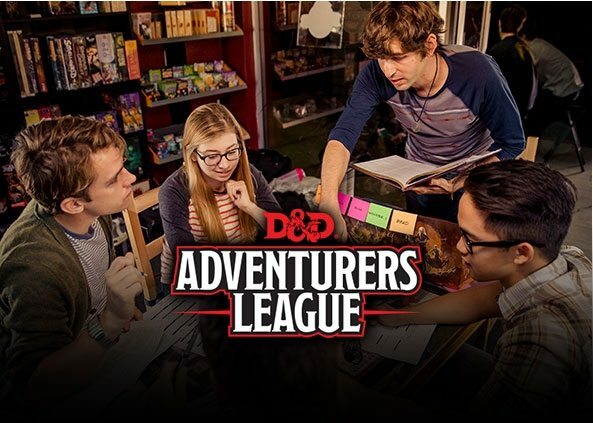 The only bummer is that the D&D Adventurers League organized play is limited to Wednesday evenings, which is a day that I typically have a conflict. But perhaps Wednesdays work well for you. In fact, I hope they do as I can wholehearted recommend that you give Adventurers League organized play a chance. D&D has a handy tool on their website that can help you find a game store that is offering it.